Port Orleans French Quarter’s “Doubloon Lagoon” swimming pool. 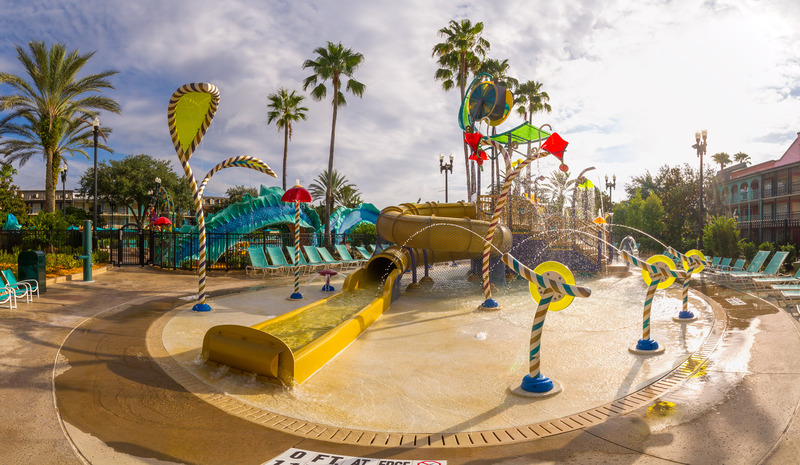 The Mardi Gras inspired “Doubloon Lagoon” pool at Port Orleans French Quarter is a lively and fun swimming area with clam shell water jets and a fabulously themed slide in which you emerge from “Scales” the sea serpent’s mouth and slide down its pink tongue into the pool. Sitting atop Scales’ head is a colourful likeness of King Neptune and situated around the pool are comical Mardi Gras characters, many of which include water features and sprays. A short distance away from the main pool you’ll find a jacuzzi hot tub and a welcoming pool bar called Mardi Grogs for the adult aprés-swim time. Opening hours: officially as per main Feature Pool, but generally not enforced at French Quarter since the hot tub is separated from the main pool area. The Mardi Grogs pool bar is open from 11:30am until 9:45pm and serves a variety of alcoholic and non-alcoholic drinks and snacks in a festive Mardi Gras setting. Port Orleans French Quarter has one Laundry Room (the Laundry on the Levee) located near to the Mardi Grogs pool bar with guest-operated washing and drying facilities — your laundry can be taking care of itself while you take a refreshing dip in the pool or have a drink at the bar. There are currently 16 washers and 24 dryers available. Note: as from April 2013, the machines at French Quarter now ONLY accept credit/debit cards — you cannot use cash, nor can you pay using a Magic Band. The cost is $3.00 per washing load and another $3.00 for drying (prices last verified January 2016). Also near the pool bar is the jacuzzi hot tub and a children’s play area.